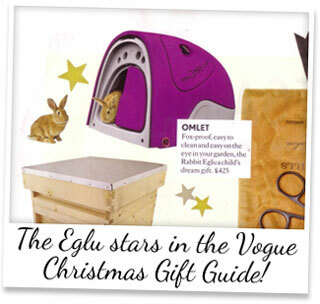 You know something’s stylish when it stars in the glossiest of glossy magazines Vogue, so we were thrilled to spot the Eglu for Rabbits in this issue’s Christmas Gift Guide. Clearly the only choice of pet house for fashionistas, the Omlet Eglu features alongside other big names such as Carolina Herrera, Burberry and Alexander McQueen. Well…we always knew it had the wow factor! Vogue has summarised the Rabbit Eglu as ‘a child’s dream gift’, and we agree that any little girl or boy would be eggstremely lucky to unwrap one. There’s just one problem though…you’re going to need a pretty big Christmas tree to fit it under! Order your Rabbit Eglu this weekend and get it delivered free by using promo code BLACKFRIDAY1. Stir Up and Win and Apron! Will you all be making your Christmas Puddings this weekend? According to tradition, Stir up Sunday is the day to fill the kitchen with yummy scents of citrus and spices and cook your Christmas pud, making several wishes in the process, of course. And if you keep chickens, those freshly laid eggs will make your festive cakes and bakes eggstra tasty. So, with one month until Christmas, why not put on your pinny, crank up a bit of Cliff and Bing, and stir your troubles away!? Send us a photo of your stirring, baking and mess-making, and you could win your choice of gorgeous new apron. Email stephanie@omlet.co.uk using subject line ‘Stir up Sunday’ to enter. Competition closes on Sunday 2nd December. 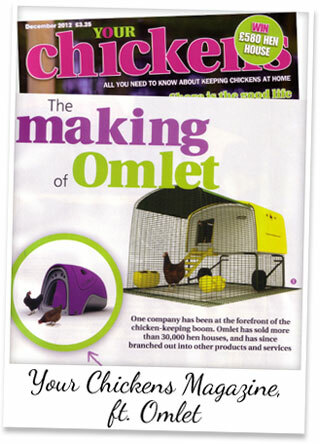 We’re big fans of Your Chickens magazine and this week we’re even bigger fans because they’ve featured a two page spread on Omlet. The article summarises the history of Omlet, talking of our key role in the chicken keeping boom, and the transformation of a university project into a cracking company. We may have filled over 30,000 gardens with Eglus, but we pride ourselves in the continuous design and development of eggciting new products to add to the Omlet range, six of which have been featured in the article. Our latest product, the brand new Egg Ramp, is one of the chosen few, and we have a feeling it’s going to be on many a chicken keeper’s christmas list this year! Your Chickens magazine is a must-read for every chicken keeper and you can get an eggsclusive saving on your subscription by clicking here. An early Christmas present to yourself, perhaps?